When you mention Goa, people visualize the vast and incredible beaches. But Goa is more than these pristine beaches and sea. 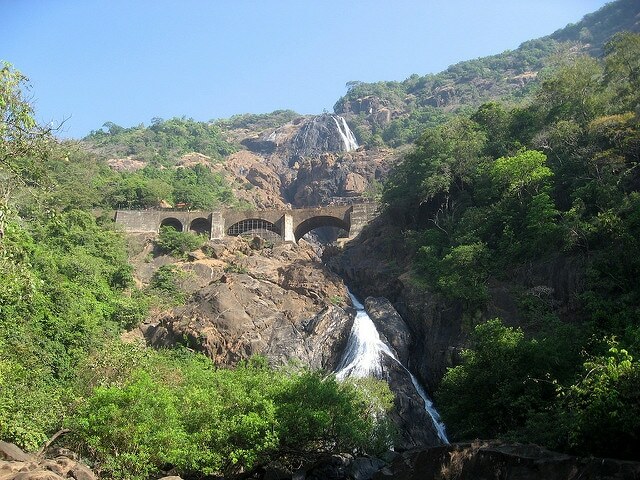 It is also blessed with varied landscape as it is situated in Sahayadri hills. 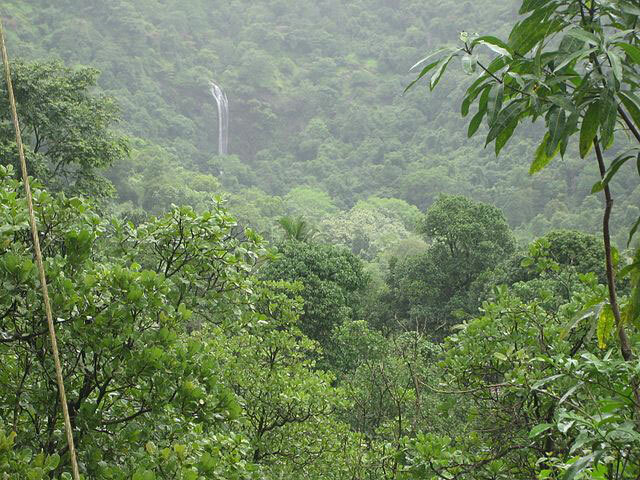 There are many small and big hills in Goa, from where streams, springs and beautiful waterfalls emerge. There aren’t too many waterfalls in Goa, but all of them are worth visiting. Surrounded by greenery, rocks and sanctuaries, these waterfalls offer another side to Goa, making it an all-rounder in terms of tourism. Here are the 8 most popular and most spectacular waterfalls in Goa that will make you swoon and gawk with amazement. Situated on the Goa-Karnataka border, Dughsagar is definitely the best and the most beautiful waterfall in Goa. It originates from Mandovi river. Dudhsagar translates to ‘sea of milk’ and the water that falls from a height of 130 m resembles just that. It looks as if a huge vessel of milk has been poured from above. It is the fifth largest waterfall in India and the greenery surrounding it makes it all the more beautiful. Located at a distance of 2 km from Sanquelim town in North Goa, the Arvalem Waterfalls is a magnificent fall as it cascades from the lofty mountains and falls from a height of 50 m. Harvalem waterfalls is also a popular picnic spot for it is surrounded by a beautiful landscape. The revered and popular Rudreshwar temple is also close by making the spot all the more popular. Located on a hilly path in Hivre village, which is 14 km from Valpoi city, Hivre falls offers a mystical view, hidden amidst natural beauty. It takes a long trek to reach the waterfalls and is a popular trekking destination as well. The best time to visit Hivre falls is during the monsoon months, that is, from June to September. Just walking upto the Sada falls is an enchanting experience in itself. You will have to cross a stream to reach the base. Situated in the Chorla ghats, Sada falls lie at a distance of 8 km from a small village in the area. As you walk along the streams taking in the cool and refreshing air, you will hear the gushing sound of the water and as your walk ends, you will find the water falling from a height between two hills, a great view. It is spread around 211 sq km in Sanguem Taluka and is within the Madei wildlife sanctuary. The whole region was covered under the sanctuary to protect it and to conserve the western ghats. You will have to trek through waters to reach Netravali falls. There is an island type hill point from where you can get a close view of the falls as well as the surroundings. The trek to Tambdi Surla falls is itself quite adventurous and fun as it is through the Bhagwan Mahavir wildlife Sanctuary. The water falls from a height from the hills and makes its way through the rocks. It is a great experience to behold the gushing waters flowing in tranquility amidst green trees and lush bushes. Another attraction of the place is an ancient Shiva temple believed to have been built in the 15th century. Located in South Goa in Canacona district, Kuskem waterfalls is situated near the Kuskem village, after which it is named. The Cotigoa National Park is also close by, which is another attraction. The water falls from a height through rocky mountains and as it nears the bottom, it becomes clear and transparent water. The best time to visit it is either during monsoons or just after that, as during summers, the Kuskem waterfalls dries away and not much of it is visible. Hiking to Kuskem waterfalls is a great experience for trekkers and adventure junkies. 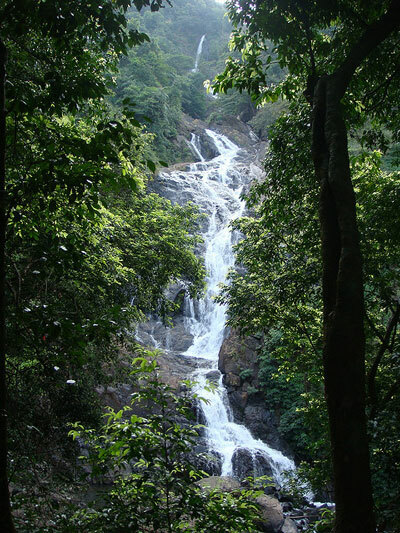 Located on Verna Plateau, the Kesarval falls is situated 22 kms from Panjim, the state’s capital. The falls are surrounded by tropical woodland and there are also vast betel palm plantations around it. Kersar Val means eagles and the waterfalls was named so, because there used to be colonies of eagles here. It is said that the water of the falls has medicinal properties and hence people who visit it do not miss bathing in its waters. Another perk of visiting the waterfalls in Goa is that you get to see the villages within which they are located and get to taste the life of the countryside. Also, there are sanctuaries within or nearby the falls, which makes your visit more fulfilling. The company of nature, fresh air, cool surroundings, lush greenery and the musical sound of gushing waters make you feel refreshed and fills you with excitement and calmness at the same time.